“Noticed you don’t do recon training. But we do. This is interesting, because it highlights a failure on my behalf to fully communicate the services we offer. Here is the Training Overview Page, with class listings. We have the Combat Patrol Class, which is dedicated to finding. fixing and striking the enemy. 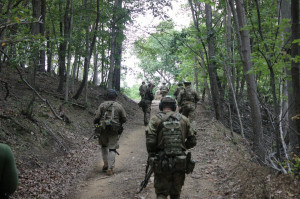 Students conduct a night reconnaissance patrol as part of that class, as well as a live ambush, raid and some other SOP training. This class is designed as a follow on from the Combat Team Tactics (CTT) Class, and picks up where that class left off, concentrating on team and squad level patrol operations. During the tactical phase of the class, students conduct a night close target reconnaissance patrol of an enemy objective. Now, some may want more, and more depth on that. We do have private classes and if you want to get in touch with me I can put something together for you. If you want to go into more depth on surveillance and reconnaissance, we can concentrate on those specific patrol operations. Thoughts that come to mind: reconnaissance patrol, observation post patrol, close target recce, construction of hides/OPs….etc. The MVT cadre has a depth of military experience, and teach no BS proven combat tactics. You can tap into that well if you want the knowledge. Our mission is to keep you away from the tactikoolaid.